The 3.93-acre property, located along the East Boston Waterfront on Boston Inner Harbor, is near East Boston’s Maverick Square and the MBTA Blue Line Transit Station. This site has historically been used for industrial purposes. From the early 1900’s to the 1950’s, the site was used for storage. After that period, confectionery companies occupied the buildings until the 1980’s. The buildings are currently used for commercial purposes, primarily as storage. The proposed redevelopment includes an additional three to six floors to the existing nine-story building and a multi-level parking garage. It also includes the construction of a new six-story building for either residential or hotel use. 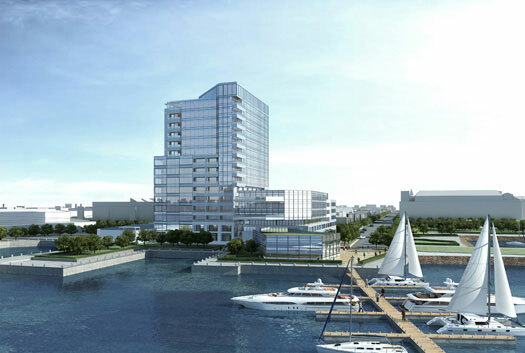 Other site features include a marina and substantial public access along Boston Harbor which includes a new Harborwalk and a water taxi landing. Cresset is engaged as a fee developer in partnership with private ownership to obtain the necessary entitlements by taking the project through both the BRA’s Article 85 and the state’s Chapter 91 licensing requirements.